Very nice rug. We have it under the dining room table. It is good quality, and looks great. Safavieh's Amherst collection is inspired by timeless contemporarydesigns crafted with the softest polypropylene available. This rugis crafted using a power-loomed construction with a polypropylenepile and features main accent color of grey. 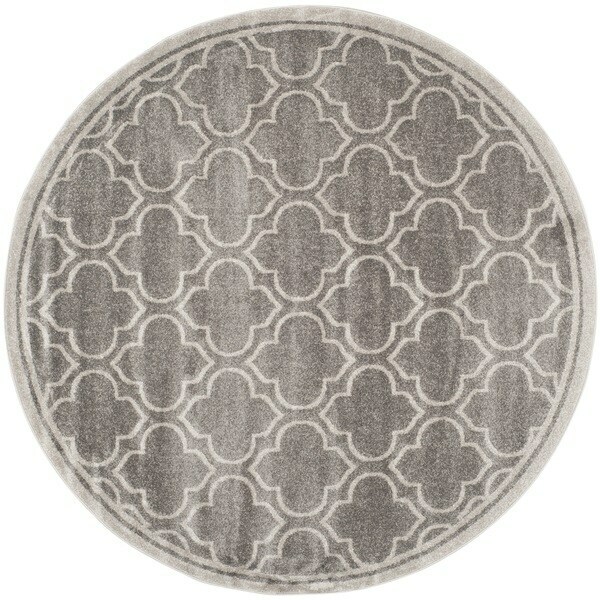 Give your bedroom or living room a stylish update with thisseven-foot round area rug. A light grey trefoil patterns offers atrendy appeal that easily complements most decor styles.Polypropelene constructions provides added durability and helpsprotect against wear, leaving you with a rug that still looks greatfor years. Very nice, not a thick rug. Rug color is a little lighter (grey) then pictured. Beautiful rug for my entrance, it gives it an updated look with this pattern on this rug! I love the color too with it being in the main entrance I don't have to worry about it looking dirty right away. Very nice low pile as well, did not want a shag for the entrance! Would not hesitate to buy it again. same with this rug I just love it as well !!!!!! I cant say on here how pleased with the rugs that I get from overstock. com so if you need a rug here the place to order one !!!!!! Looks great and the color is true to the description. I needed a round rug for a table and chairs in a breakfast nook. This rug is very pretty and the quality is great! Really nice rug, very good quality and lays nicely right after unrolling. I wish I would have bought the next size up because the rug doesn't overwhelm the furniture and adds a lot to the room. This adds a designer touch to my living room. Placed between two couches over dark hardwood. The rug centers room and we have received many compliments! Like another person commented on a different size of this rug, badly packaged with no cardboard tube in the center, so it was very creased, with one end really folded badly and taped around . Also, there is a noticeable difference in the width of the border,...almost an inch in one section. I would re-order if I thought this was a one off,..but not so sure ? Just what I expected. Great value. 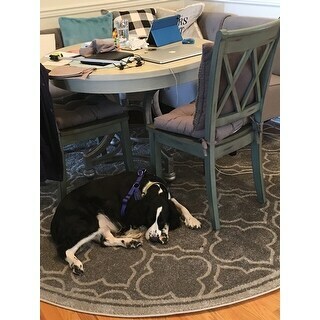 Using under dining room table and cleans up well also. Love the color.love the price. "Does this rug have a backing?" Yes, there is a backing on this rug. What kind of a backing do I need for a hardwood floor with this rug? It is the perfect size and color.